Humiliated in previous years in Brighton, the racist March for England are this year calling on as many EDL splinter groups and outright Nazis as they can to bolster the numbers on their annual parade. Accordingly the Anti-Fascist Network is urging all anti-fascists to head to Brighton on the 27th April to support the mobilisation to Stop the March for England. Brighton has become a line in the sand for the far-right. Because Brighton is a relatively liberal cosmopolitan city, they see it as a hotbed of “anti-English activities”. They hate Brighton and they know that Brighton hates them, but they keep coming back because they cannot be seen to back down. This year’s March for England has the added significance that it is a national outing for the newly formed far-right alliance the United British Patriots, which hopes to be the successor to the EDL on the streets. Now is the time to stand up to them before they have the opportunity to achieve this ambition. 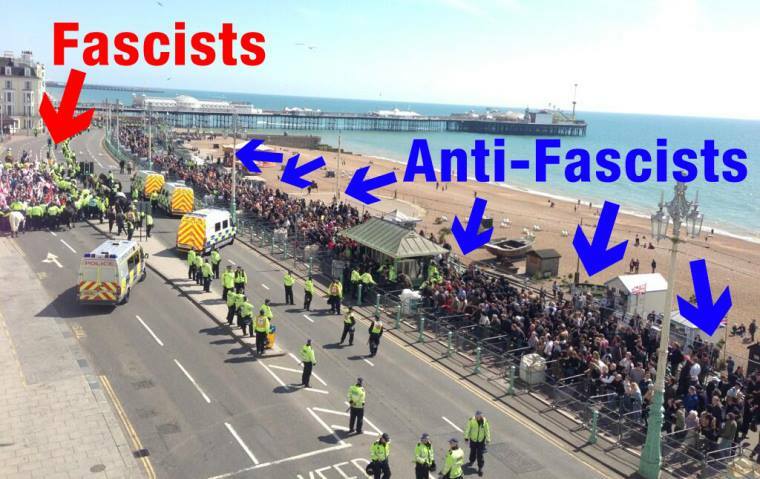 A big show of strength in Brighton will send a clear message to this new alliance of fascists and to the far-right in general that the people of Brighton will never accept a far-right parade to go through their town unopposed. All anti-fascists should mobilise to support them. All out for the 27th in Brighton! Meet Sun 27th April, Palace Pier roundabout, Brighton seafront to line the route of the march. Time TBC nearer the date.